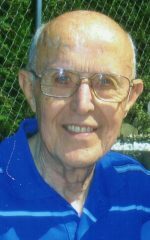 Marvin Ward, 93, of North Webster passed away on September 18, 2018 at his home. He was born on May 2, 1925 in Huntington, IN to Ora & Alice (Neal) Ward. He did his undergrad work at Huntington College, and received his Masters from Indiana University. He served in the United States Army Air Forces in WWII in the India China Theater flying fuel over the hump. On November 8, 1947 he married Susie Yates who preceded him in April. He was an avid Chicago Cubs, and I.U fan. He taught school in Markle, Bippus, and Millersburg. He retired as Superintendent of Fairfield Schools in 1984 after 20 years. He was a member of the Retired Superintendent Association, as well as a member of the North Webster American Legion Post 253. Marv is survived by his son – Steve (Sue Holzinger) Ward. 4 grandchildren – Scott Murphy, Bobby Murphy, Ashley (Nathan Ries) Ward , and Nicole (Trent) Nabinger. 8 great grandchildren. 1 sister in law – Mary Ward. Along with his wife, he was preceded by 1 daughter – Vicki, 1 brother Walter, and 2 sisters – Mary Jane & Helen. Services will be Monday, September 24, 2018 at 6 PM at the Eastlund Funeral Home with calling from 3-6 prior to the service. Pastor Mike Beezley will officiate following Military Honors by the North Webster Legion. Memorial contributions may be made to the North Webster Public Library.